It’s tough to stay consistently on top in a sport that is as competitive and physically grueling as the NFL is, which is why even the top NFL stars have poor campaigns. With that in mind, we’re taking a look at 10 NFL stars who are poised to make a strong recovery after having trudged a frustrating, difficult road in 2018. It quickly became apparent last year that Newton’s throwing shoulder was not right. He struggled to drive the ball downfield, embarrassingly so at times, and was ultimately shut down for the final two weeks before undergoing offseason shoulder surgery. Newton is progressing well in his recovery and will likely be a full go for training camp, however. Playing with superstar Christian McCaffrey, up-and-coming receivers D.J. 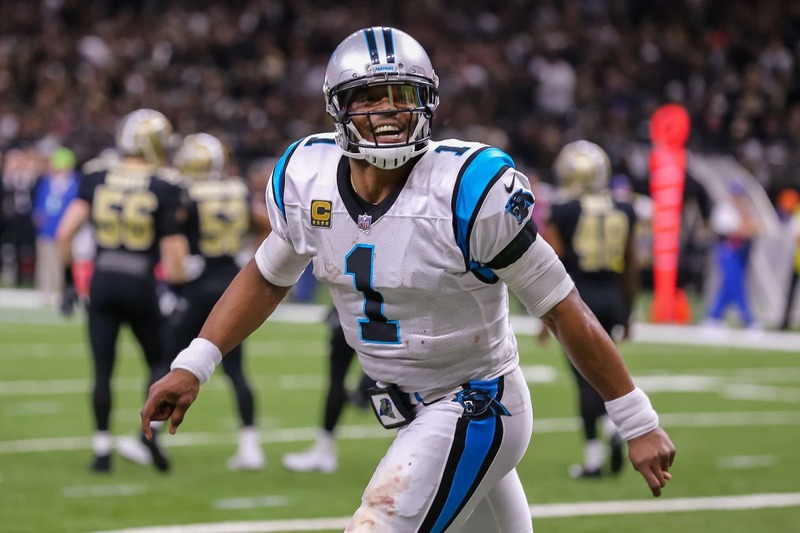 Moore and Curtis Samuel, along with tight end Greg Olson, Newton has the tools he needs to thrive once again. Beasley’s 15-sack 2016 season feels like a lifetime ago. Since then, the former Clemson star has taken on a secondary role in Atlanta’s defense and tallied just 10 sacks the past two years combined. However, with head coach Dan Quinn taking over the defense again, and given the team’s $12 million financial commitment to him in 2019, we’d expect Beasley to come up big in a contract year. From a performance perspective, Green was dynamic when healthy last year for the Bengals. His three-touchdown performance against Baltimore stands out as the pinnacle. Unfortunately, he suffered a nagging, painful toe injury that ultimately landed him on injured reserve. Now coming back healthy, Green is excited to play for young, offensive-minded head coach Zac Taylor. And who knows? Perhaps he’ll also have a new quarterback to play with in 2019. Last year was frustrating from a team-wide perspective in Jacksonville. Dysfunction ruled, and Ramsey clearly lost some of his focus, which led to a sub-par season for the young star. Sure, he had three interceptions and 13 passes defensed. Not bad. Yet Ramsey is an All-Pro-caliber player who was merely okay last season. We expect him to turn things around in 2019 as he seeks a new long-term deal in 2020. The 2018 season was one long train wreck for McCoy. He was banged up all year long and missed two games. McCoy was also getting destroyed weekly by opposing defenses playing behind an awful offensive line. Buffalo has done some phenomenal work this offseason to shore up that line. The Bills also provided more weapons for Josh Allen in the pass game. With more options on offense overall, and better blocking, McCoy should look like himself again. Matthews has clearly been in a decline in recent years. He hasn’t registered double-digit sack totals since the 2014 season. Some of that was due to being misused in Green Bay. Some of that was due to normal wear and tear. Now in Los Angeles, Matthews won’t be asked to take on such a large workload. He’ll be more of a rotational defender on a defense that’s loaded with talent and has Wade Phillips calling plays. This should lead to him being more fresh, and much more effective. There is a lot of talk right now that Oakland could draft a quarterback in Round 1. Even if that happens, Carr will almost certainly start this year for the Raiders. Last year was frustrating for the quarterback and his entire offense. However, this offseason Oakland was aggressive in bringing in top offensive talent via free agency — offensive tackle Trent Brown, along with receivers Antonio Brown and Tyrell Williams. Carr showed he can play at a high level before breaking his leg in 2016. If he can get his confidence back, both he and the Raiders offense should shine in 2019. A foot injury hampered Bosa in a big way for much of the 2018 season. He only appeared in seven games, starting six. Despite that, he had 5.5 sacks during the regular season and another in the team’s first playoff game. One of the most dominant pass rushers in the NFL when healthy, Bosa will once more be a quarterback’s worst nightmare this season if he can stay out of the trainer’s room. When Jackson signed with Tampa Bay ahead of the 2017 season, he expected to thrive playing with young quarterback Jameis Winston. The two of them never developed chemistry, however, and his best games came when he was playing with Ryan Fitzpatrick. Now back in Philly, he joins a talented receiving corps and a quarterback in Carson Wentz who is adept at throwing the deep ball. One of the best deep-ball receivers in NFL history (17.4 yards per catch throughout his career), Jackson will fly high with the Eagles in 2019. In pretty much every viable statistical category, Collins had his worst year as a pro in 2018 playing with the New York Giants. It’s worth pointing out that New York’s defense, in general, was pretty bad all the way around as well. The Giants opted not to pay Collins and let him hit free agency, which he was not happy about. Now he’s with a divisional rival with a massive chip on his shoulder, playing the same position on the same team his idol Sean Taylor played for. Look for Collins to have a monster season in our nation’s capital in 2019.